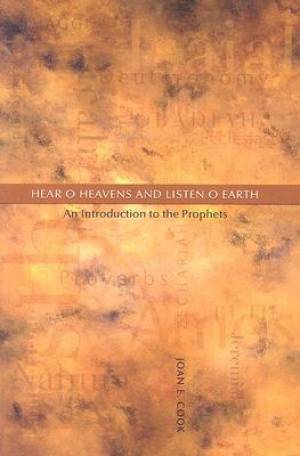 In Hear, O Heavens and Listen, O Earth, Joan E. Cook guides students of theology, Scripture, and ministry in reading the prophetic books according to the current methodologies for biblical study. She encourages readers to apply the messages of the prophets to contemporary religious and social concerns. Cook focuses on how to read the Old Testament books of the prophets and addresses the pastoral implications. The study proceeds chronologically and biblical quotations and references are based on the New Revised Standard Version of the Bible. Cook encourages students to engage the biblical text and suggests points for reflection and questions for thought and action based on each of the prophetic books. Hear, O Heavens And Listen, O Earth by Joan E. Cook was published by Michael Glazier Inc in June 2006 and is our 40308th best seller. The ISBN for Hear, O Heavens And Listen, O Earth is 9780814651810. Be the first to review Hear, O Heavens And Listen, O Earth! Got a question? No problem! Just click here to ask us about Hear, O Heavens And Listen, O Earth.